Paramotor Trike VS Foot Launch Paramotors - Which one is better? It's time for the paramotor trike to take on the pilots favourite, the foot launched paramotor, and you will be our judge! But which one has what it takes to impress you? And which one will offer pilots the best overall experience? Let's put them through four rounds to see which one comes out on top. All good battles must start with a weigh-in, so I'm choosing the two lightest machines I could find from reputable manufacturers for this round. The Air conception Nitro 200 foot launched paramotor against the Fly products Foxy trike. The Air conception Nitro 200 weighs in at just 19 KG making it one of the lightest paramotors on the market. The Foxy trike weighs in at 9 KG without the paramotor attached, as pictured below. This is a super lightweight aluminium design, and is one of the lightest trikes on the market. The combined weight isn't listed, but it's sure to be over 30 KG with the motor attached. The foot launched machine is super lightweight, making it perfect for those who struggle to lift heavier machines. Lighter also means better fuel economy, and a better glide ratio. Trikes will always be heavier, but does this really matter? You won't be holding them on your back or trying to run with them during landing. Slightly heavier means more fuel burn, and heavier input is required on the controls, but this certainly shouldn't put you off. Prop strikes when starting foot launched paramotors are very common (see here). Starting a trike will be less risky due to it's inability to flip over if the throttle goes to full power. Trikes may pose a little more risk during launching due to their tendency to tip over if the wing gets a little wonky. Due to their weight, they may also need a little extra runway to get off the ground, so be sure the field is big enough. Some trikes will have high frame bars that will obscure your vision, similar to windscreen pillars in your car. This means you will have to move around a lot to check for other aircraft. Climb rate will be better on foot launched paramotors, this makes tight turns at low altitude safer. This also means you're less likely to fly into low objects like power lines or trees on a foot launched machine. 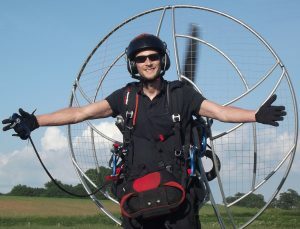 Modern paramotor wings are pretty damn safe, but heavier loading will make a wing that little bit more collapse resistant. A trike will be heavier so the wing will fly faster, thus keeping the wing more pressurised. Trikes may require a slightly longer landing strip, but they will generally be much safer to land. There's no risk of tripping of falling, as with foot launched machines, and fast landings are no problem. This is also good for your wallet, as the propeller is at less risk. And the winner of round two is? Both breeds of paramotor have their pros and cons, so this could be a tricky one! 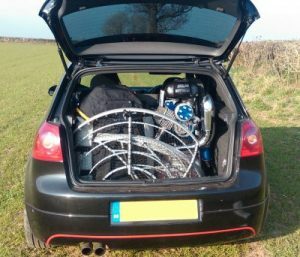 A foot launch paramotor will easily break down to fit into a small car or van. You can even leave them fully assembled and transport them on a carry rack. The ease of transporting a trike will depend entirely on your choice of machine. 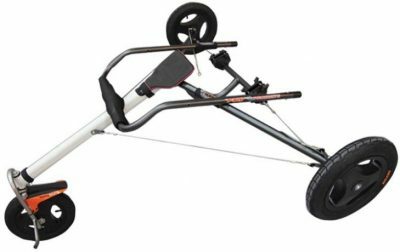 If you choose something like the Fly products Foxy trike that we saw earlier, transporting it will be just as easy as a foot launch paramotor. This also applies for storage, a small shed will have plenty of storage space, or you could keep it under the stairs like I do! If you choose a trike like the Parajet Falco or the Fresh Breeze xcitor, you'll need a fairly large van, as these trike don't easily break down for transport. Storing one of these will require plenty of garage space, don't expect to keep it under the stairs. Most people will opt for the foot launched machine because of the ease of transport. I think this is why they will always be more popular. But if you have plenty of storage space and a big van, why not get a trike? There may be a few other things to think about that are specific to you. For example, maybe you like the sound of paramotor camping, but the thought of carrying all of the gear on a foot launch machine puts you off. Maybe you have a disability that prevents you lifting a foot launch paramotor. 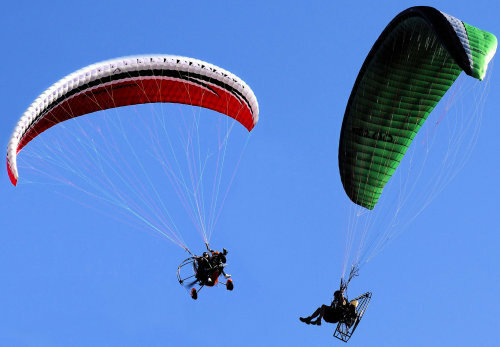 Trikes have made the sport of paramotoring accessible to people that always dreamed of flying, but were held back by simple injuries, or ailments. Or maybe you like long cross country flights, but the weight of a full tank of fuel makes it hard for you to launch on foot. A trike can solve many problems, but don't forget to check whether they're legal in your country. In the US, single seat trikes, or quads can be flown under FAR 103 rules, which means no license is required. Twin seat machines will require an airman certificate, and the cart must be registered with the FAA, and have a federal airworthiness certificate. You will then be operating under FAR parts 61 and 91. Dual training under FAR 103 is also available through an FAA exemption. In the UK single seat trikes and quads must weigh less than 70 KG fully fuelled to be flown without a license or registration. If the weight is over 70 KG, but still under 115 KG, the machine will be classed as an SSDR or single seat deregulated aircraft. You'll then need a valid NPPL M microlight license, which will also cover you to fly twin seat trikes and quads. So which one gets your vote? For me the ease of transport was the decider, so I will be sticking with foot launch for the time being. I've flown trikes and really enjoyed it, and I do really like the thought of a big trike for long cross countries and adventures; so I'm definitely not ruling one out for the future! Thanks for checking out paramotor trike VS foot launch, check out paramotor VS ultralight HERE. 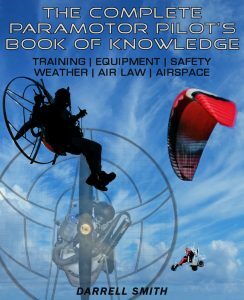 Or find out just how far you can really fly on a foot launch paramotor HERE.